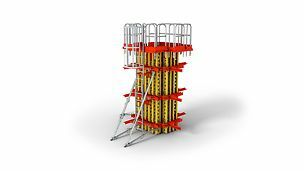 Column Formwork is to be designed to be able to accommodate relatively high fresh concrete pressures as comparatively small cross-sections are concreted quickly. 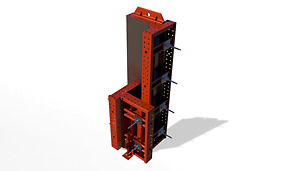 Therefore, the joints in particular are to be formed very carefully and tightly sealed. 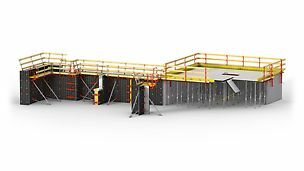 Column formwork is comprised of panel formwork elements or based on individual formwork girders; steel formwork is also available. 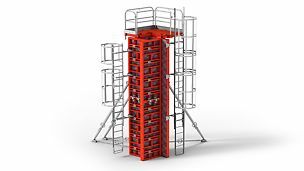 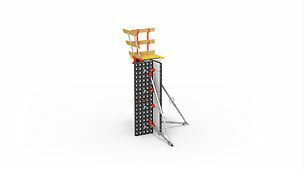 The quick and easy adjustment of the cross-section and height with minimum effort and the least possible number of system components is an important criterion for the cost-effectiveness of a column formwork system. 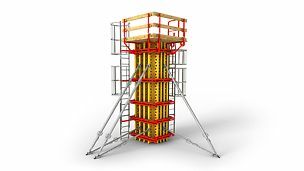 In addition, columns with the same cross-sections are frequently required to be constructed in large numbers so that the systems need to be quickly transported to the next place of use without any assembly effort. 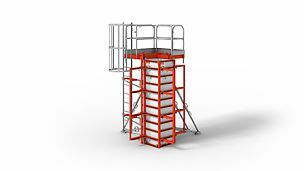 Furthermore, system solutions have been developed with which the high demands frequently placed on concrete surfaces, evenness or the sharp edges of corners can be fulfilled.